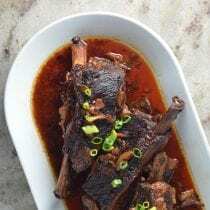 I’ve got a tasty and simple new comfort food recipe for you—Slow Cooker Korean Short Ribs! This turned out even better than I was expecting. With only a few ingredients to mix together, including only two that you actually have to cut with a knife, it could not have been any easier to make. I served it over brown rice ramen noodles with roasted carrots and other veggies on the side. What’s your favorite thing to make in your slow cooker? 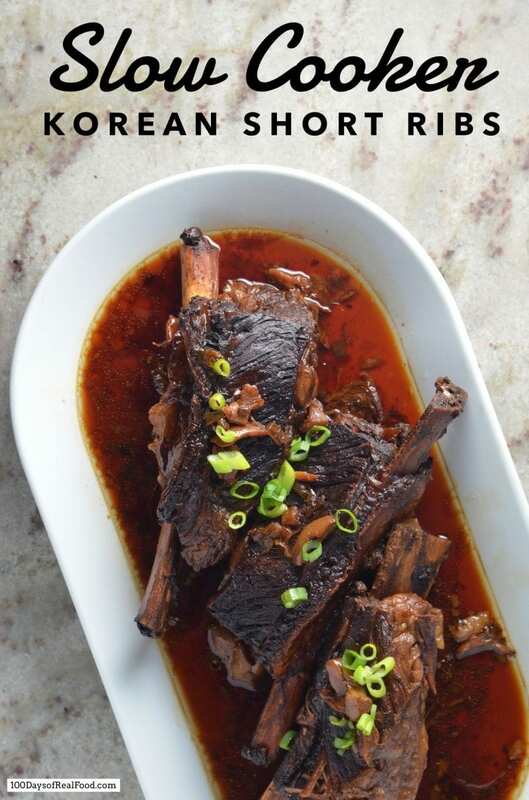 Place the short ribs in the bottom of the slow cooker. Whisk together the rest of the ingredients and pour over top. Cook on high for 5 or 6 hours, until the meat is falling off the bone, flipping the meat over once during the cooking process for even flavor. Gluten-free of gluten-free soy sauce is used. Is there something I can use as a replacement for sake? I have the same question. Don’t want to buy sake just for 1/3 cup. Would red wine work as well? Have you tried using the bones for beef broth after picking the cooked meat off? i cannot wait to try this – valentines day meal for the family this thursday! thank you Lisa! I have all of the ingredients to make this dish tomorrow. It was my first time purchasing sake. The bottle is quite large and it looks like we only need a third of a cup. I just googled it and it seems as though it needs to be finished within a few weeks of opening. Is that the case? Seems like I need to buy a new bottle every time I make this recipe?